I recently read the news that an American Air Force base was flooded and nearly devastated in Nebraska. Fox News reports on March 20, 2019 that Offutt Airforce Base is under water to include offices, warehouses, and runways. Who cares you might ask. Well, you should; especially if you are a purveyor of military surplus equipment. Because whenever military items become exposed to the elements like that, you guessed it, they immediately become surplus items. Nothin in the public domain gets thrown away regardless of what it’s been through. Which brings me to todays talking point, how to discern the good surplus from the bad. Disasters like this should always be well researched and followed so that, if you are one to buy military surplus items, you can make sure that you aren’t getting damaged equipment. Most military surplus resellers are honest, hardworking people, but let’s face it, not all of them are well informed and quite often they won’t know the history of the surplus items that they buy in lots. So therefore it is up to you to investigate when and where the natural disasters are happening, and then seek out that equipment that might have come from there. Last year for instance, the Carolinas were hit hard by Hurricane Florence and Parris Island as well as Camp Lejeune were both affected. So were the New River Air Force base and Camp Geiger. It stands to reason then that any surplus coming out of these areas for the next year or two would be deserving of special attention to ensure that no significant damage had been inflicted. A few questions to the reseller will often answer any questions you might have, because even though the history of an item won’t be known, the location they were purchased from most certainly will. And so I take my final bow as I present to you my kayak, all tricked out and ready to go on lake-water adventures as I endeavor on a trip to capture the stoic visage of a family of American Bald Eagles which inhabit the local state park. I have labored long and hard on it, (not really), and I have done all that I wanted to in order to get it seaworthy. Here are the changes I have made to it that make it ready to capture the photos and video that I am going after. I installed a go-pro mount on the top at the bow. I discovered right off that trying to mount it with marine rivets as I did nearly everything else, because the rivets heads would interfere with the camera mount. Hopefully the gorilla glue that I utilized to mount it will hold, otherwise I’m going to be hoping that the waterproof case makes it float. I used the gorilla glue to also mount two watertight cases to the floor of the kayak. One is big enough to hold the camera that I plan to use for the kayak photography, and one to hold my cellphone. Though I could have easily drilled and riveted both of these cases in, I didn’t relish the idea of breaking that watertight seal in any way. 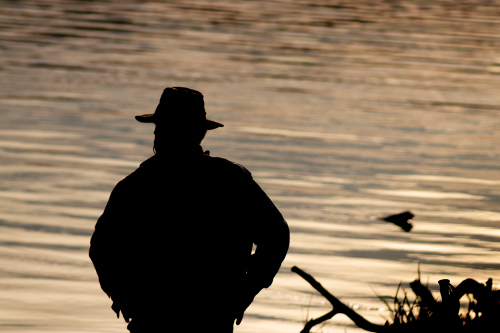 Kayaks become more valuable with age. And, like good military surplus, those that have a little wear and tear on them, (like a Vietnam era canteen with a bullethole in it), are worth much more than those that are brand new still in the package. I mean I pored over the used kayaks in the online classifieds. 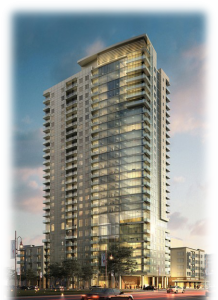 I called, made offers, placed bids… all to no avail; because, every single kayak owner I found, who was willing to part with their beloved kayak, refused to do so -it seemed- without at least doubling their money (and sometimes tripling it). And so, after a couple of weeks of frustration, (yes I’m tenacious), I finally got on the Wally-world site just see what they had to offer. Boy, was I pleased. Wally-world had everything I had wanted and dreamed of right there at my fingertips. Not only were the exact kayaks I wanted available, they were the right color, $40 cheaper than anywhere else, and they came with oars! 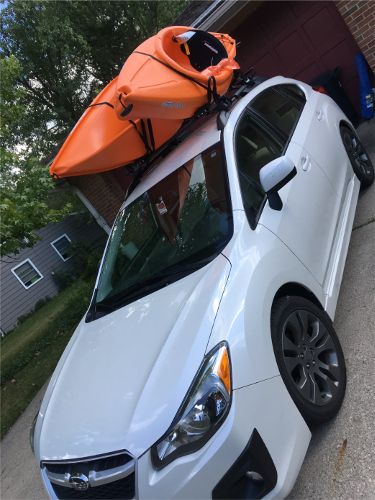 Plus, Wally-world had a roof rack to fit my Subaru, AND they had a set of kayak racks as well. All told I spent $448 dollars and there was no shipping costs because I had the entire kit and caboodle sent to my local Wally-world. They sent me an email when it all arrived, and I shot right over there and installed the rack and roof mounts right there in the parking lot with a $5 tool kit I bought in the hardware section. Total cost… $453, (including the toolkit). 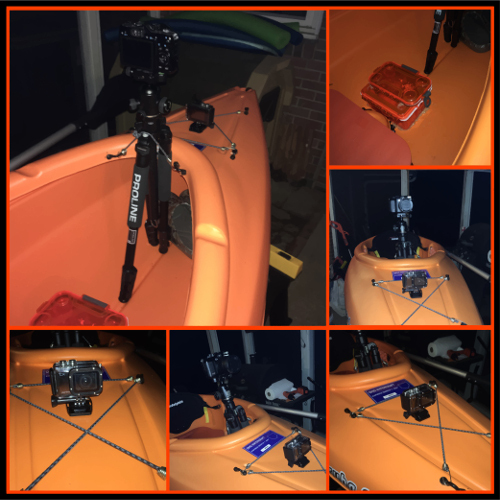 Well, kinda… in the next installation, I will show you the modifications I found necessary to get my kayak right where I needed it to be to turn it into a wildlife photography machine… Stay tuned! If you use an ATV, then you realize that one of the big aspects of owning and using an all terrain vehicle is the fact that they require a lot of maintenance. 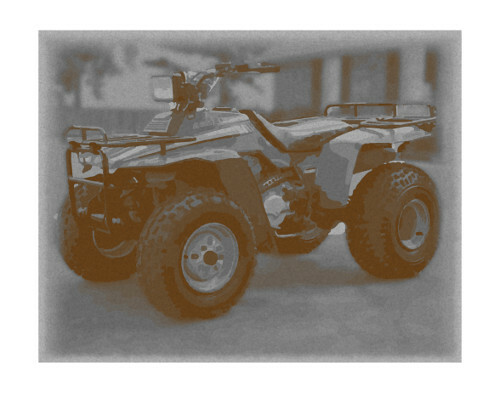 That being said, there are several important questions that you must ask yourself regarding whether you want to try to use an older model ATV or whether you should invest the resources into buying a new one. Unquestionably an ATV comes in handy for everything from treasure-hunting to deer hunting. They are great methods of transportation for military surplus tent adventures as well. These things can carry a lot of weight and if you can balance it on your ATV, then you can usually transport it wherever it needs to go. However, here are three things you need to think about when deciding what type of ATV to get and use. Parts availability. 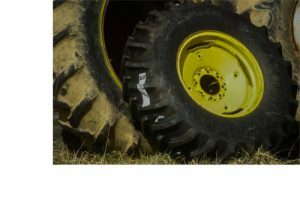 One of the biggest problems you’ll run into when keeping an older ATV is the fact that the parts for it are going to be hard to come, and it is certain to go down at some time or another. Your best bet if you are going to use an older model ATV is to buy some spare parts whenever you can and keep them. This means extra fuel pump and several filters, spare cables and custom fittings, and any fuses or spare switches you can pick up, as well as several oil filters. Ease of maintenance. One of the advantages of an older ATV is the ease with which they can be worked on. ANY incorporation of electronics into the power train is going to result in complications in the mechanical function of the ATV in the event of a SHTF type scenario. Ease of transport. The lighter your ATV, the better off you’re going to be if you have to push, pull, or carry it. I once had a Honda 4trax that was light enough I could load it myself into a pickup truck without a ramp. It was on 250CCs, but it worked great for everything I needed it for. The government warehouses are full of treasure and buying surplus military clothing and equipment is the way to mine it. Though the days of the battle ridden surplus of World War Two and Korea are gone, many can still recall the joy of sifting for hours through piles of olive drab. Treasures back then were different than they are today. A long bayonet, canvas .45 holster, or a metal canteen – often replete with a bullet hole or two – could set both man and boy aglimmer with excitement at the prospect of a world at war. The bullet riddled items scarcely cost much more than the ones that could actually be used but they were always the first to be snatched up. Old Colt .45’s and Tommy Guns with thirty round magazines could be found next to Springfield 1903’s and M1 Garand’s, all silent after having barked their destruction into the mass of an invading army. There was so much equipment left after WWII that the government had a rough time getting rid of it. The world moved on and the rules have changed. You can’t buy old flamethrowers and weaponry as surplus anymore but that does not mean that there aren’t treasures galore to be had in the new piles of military surplus gear and equipment. Today’s market isn’t restricted to USA surplus either. European military surplus has been made available to the masses, as has Russian, German, and Israeli. A trip to your local surplus store can reveal almost anything. Of course you buy camo pants and shirts, but did you know that you could possibly find a BPS, (military jargon for a big plastic shoppingcart)? Was your father or other family member in the armed forces during a conflict? Quite often you can find unit insignia and period surplus uniforms which match those that he, she, or they wore during their service. There are many practical civilian uses for military surplus items. Old document cases and shoulder packs make excellent ipad cases. Modern day hunters who like to shoot primitive weapons such as black powder rifles will be well pleased with a military bread bag to use as a “possibles bag” for quick at hand shooting supplies. Two bread bags would be an ultimate for dove hunters, one to hold shells and the other to hold birds. Military surplus makes a great medium for artist and upcyclers as well. Consider upcycler Jake Wright who makes beautiful furniture from decommissioned, upcycled military surplus; while others find surplus gear and accessories useful as an artistic medium for a memorial day war display. Than that used by the military. You won’t find a better value for your money either, as some statistics show that military surplus usually sells at 1 – 2% of its commercial value.1 So if you are a hunter, outdoorsman, picker, artist, upcycler, war buff, or collector, make sure you check your local surplus store. You just might be surprised by what you find. If you are a survivalist, prepper, self sufficient, hobbyist, naturalist, do it yourselfer, or just a fan of delicious sugary goodness then now is the time for action! I speak of course of the time of year for those of us who are self-sufficient to get our tin buckets out of the shed and tap those trees that are good for syrup making. Of course we all know that we can tap all types of maple trees to get the sap for syrup, but did you know that you can also tap walnut trees and birch trees? If you are into this, or if you have ever wanted to get into it, then now is the time to get started, and here are three things you must do right now in order to get started. Go out and find good sap trees. The bigger the better, and you need to map your trees and mark them as you go so that you don’t forget where they are. A quick Google Maps search or check through your local auditor site will usually leave you with a great topological map that you can print and use in the field, but a better option is to use a smart phone and make a gps map in an app. Gather all of your equipment together at once. You will need cans, tops, taps, a rendering pot, and lots of receptacles for storing your sugary goodness. Set up a block of time. 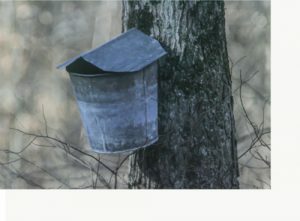 Though I’m not going into detail on technique in this writing, I will tell you that it will take hours for your sap to render to syrup… it takes ten gallons of sap to make one quart of syrup. There are plenty of tutorials out there for making maple syrup, and it is not rocket science. As a matter of fact, Penn-State University has an excellent resource for sap rendering and syrup making. Making and rendering your own maple, walnut, or birch syrup is second only to churning your own butter or grinding your own flour. It is also inherent to having your morning pancakes become something that is more than just breakfast… they become an experience. When the time comes to head for parts unknown, one of the things you are going to want to have at your disposal is a shooter’s bench. If you do any amount of shooting using optics, then a shooter’s bench is going to be a must have piece of equipment. 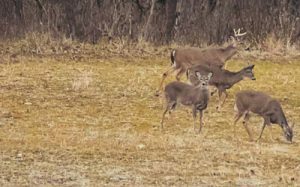 There is no way to keep a scope zeroed in without a good rest and the ability to relax and take long distance, well timed shots. I personally try to shoot with iron sights as much as possible; however, I do know that sometimes you need to reach out and touch some other mother’s son, and to do that you need accurate optics. I have looked over many different types of shooters benches, some homemade, and many factory made. The video link I have posted is by the far the best and most affordable that I have found, and I have made two for myself. I use them at the firing range now, and the fact that they are portable will only make them more valuable to me when it comes time to bug out. I usually have one or the other of them in the bed of my truck, so when the SHTF, I will not need to even think about them. Grab a bugout bag and go! To make, simply cut the correct shape, and attach folding legs as per the linked video. These shooter benches are super sturdy, and you will be surprised at how well you like them. I use a pile of sandbags for mine, because you just need to carry the empty bags and fill them at the range, that way they lay flat and don’t take up much room at all. The bags can be used for hunting/gathering, building material and many other things as well. If you have ever been a historian of the Civil War or an aficionado of Native American history, then you will know about the two survival foods that took both the Indians and the Europeans through many of their wars. I speak of course about Pemmican and Hardtack. 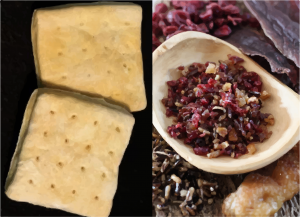 Both of these survival foods are easy to make and will last a long time. Hardtack may even last forever. Both are made from some pretty common items, both are filling and calorie laden, and you could begin stocking up on both very easily. Here is how to make them. Separate meat from fat and jerk the meat. Then melt the fat. The jerky should be so dry it crumbles, and the fat should be strained to get the detritus out. Grind the jerky in a coffee grinder. Grind up any berries or nuts that you want to incorporate. Store in a cool dark and dry place, or freeze. Can keep for years. Gather the ingredients, 3 cups of white flour, 2 teaspoons of salt, 1 cup of water. Mix together in a bowl adding water until it doesn’t stick to your hands. Poke holes in each square. Bake for 30 minutes on each side. Using any meat or fish of your choice, the trick is to slice it as thin as possible. The point of both methods is to dehydrate the meat to prevent bacteria from spoiling it, and the drier the meat the better it will cure. Rub salt all over the meat. It will draw moisture out and will kill bacteria. Set in the hot sun. This will roast/dry/jerk the meat, turning it into a very hard sheet of dehydrated muscle. Eat with care. This is a very hard and dry piece of meat and it is very salty as well. Look closely for signs of spoilage, and sniff well. Can be used to mix with berries and nuts to make Pemmican, but is also good to boil with vegetables and tubers for stew. Using any meat or fish, slice as thin as possible. Build some sort of framework to go above your firepit. This framework is often multilayered and triangular in form to allow the smoke to rise and coat the meat evenly. The point is complete dehydration of the meat. Build your fire and put green wood on it. Either fruit or nut wood works best. Avoid the evergreen variety, and any sort of bitter wood as this will permeate your jerky and gag you when you try to eat it. Cover the meat. This is done to contain as much smoke as possible. If you have a dead deer, you may use the deerskin to envelope the meat and will thereby smoke the hide too. Smoke until completely dry. It helps to flip the meat also, giving the bottom part against the wood of your frame a chance to dry out too. Smoking time will depend on how thinly you sliced your meat. If you are at all like me, then the worst thing that you can ever find yourself doing is going to a big city. I am not joking when I say that I’d rather be poked in the eye with a stick… not a sharp stick, than to go to the big city. The reason is that it is just so full of people. I, as a survivalist, see other people as competition for resources. Unfortunately there are many times that I have to go to the city for business, taking the wife to a broadway show, etc… However, whenever I do, it doesn’t leave the back of my mind that we are just one act of terror away from a full blown survival situation, and because of this I try to prepare accordingly. There are three main concerns that I have whenever I’m in the city and they are fairly common sense. I call them the sacred city three in contrast to the “sacred four” of survival: Shelter, Water, Fire, and Food. Here are the three things I worry about and how I try to prepare for them. Water. This is a pretty easy one. After my wife and I get our baths/showers for the night, we fill the tub up. That’s it; fill it up in case you need it to fill bottles, wet towels, wet blankets, wet yourselves, etc…You can drain it if you need to use the tub again. As a matter of fact we often leave it full when we vacate just in case. Fire. I don’t mean the making of it, in this instance I mean the escape from it. The water from number one can come into play here as well, and one of the reasons we leave the tub full is so that we can wrap wet blankets and towels around us to protect us from heat if we have to make a hasty retreat in the midst of flames. Weapons. When I fly I don’t take guns with me. Therefore, I make a mental list of non-typical weaponry that is available to me for the event of an emergency. don’t limit yourself, there are lots of non-traditional options available which are the equivalent to the “lock in a sock” of prison fame. © Copyright 1985 - 2014 RDD USA. All Rights Reserved.